Flash flooding kills in excess of 140 people per year (the National Weather Service Weather Forecast Office). The largest floods in American history have created a death toll measured by hundreds. Some single floods have total property costs in the billions. Flash floods occur shortly after rainfall hits, creating very quickly, incredibly dangerous situations. Communities and buildings close to rivers are especially susceptible to extreme flooding. The seven worst American floods are listed here from least to most damaging. 1. Don’t wait to buy sandbags. If you try to buy after the water is rising, you are too late. 2. You’ll need bags, sand, and people within a minimum of an hour before the beginning of a flood. 3. Just 200 sandbags bags can save thousands of dollars in damage. 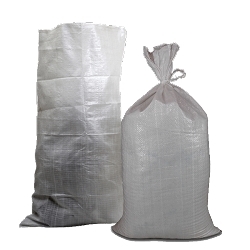 If you have any questions about how to fill or stack your sandbags or would like to shop our Top Rated e-Store - visit us at InterBULK Express. South Dakota is prone to flash flooding. In 1972, 238 people were killed in Rapid City at a total cost of $165 million (Rapid City Public Records). It occurred at night which most likely inflated the death toll. Residents were sleeping and confused and some never knew what happened. August of 1969, Hurricane Camille killed about 256 people (National Weather Service). Three people also died in Cuba. Damages were over $1.4 billion (National Hurricane Center). The flood of 1927 is considered to be the most destructive flood in American history. More than 500 people perished and close to 600,000 were left homeless (PBS). Hurricane Katrina is the most expensive natural disaster in United States history with a final tally of over $81 billion. More than 1,800 people died. On may 31, 1889 heavy rains and runoff raised the level of a man-made lake to dangerous levels. The dam that held back the lake gave way around 3 p.m., sending a surge of water over 30 feet high down the Little Conemaugh River Valley. It swept away entire communities, 1,600 homes, people and even locomotives. Debris including floating houses and barns backed up at a stone bridge at Johnstown, 15 miles downstream from the dam. The body of one victim was found more than 100 miles away in Steubenville, Ohio. Among the victims were 396 children and 99 entire families. About 750 victims were never identified. Over 2200 died. It was the worst man made disaster until 911. On September 8, 1900, in Galveston, TX, the storm made landfall, leaving about 7,000 to 12,000 dead. It remains to the present day the deadliest single day event in US history.